Past “gentlemen’s agreements” aside, deciding the next World Bank chief is not the sole prerogative of Donald Trump. Will Ivanka Trump become the next World Bank President? There is speculation that the President’s daughter is among the names thrown into the mix to replace the current president, Jim Yong Kim, who recently announced his departure. 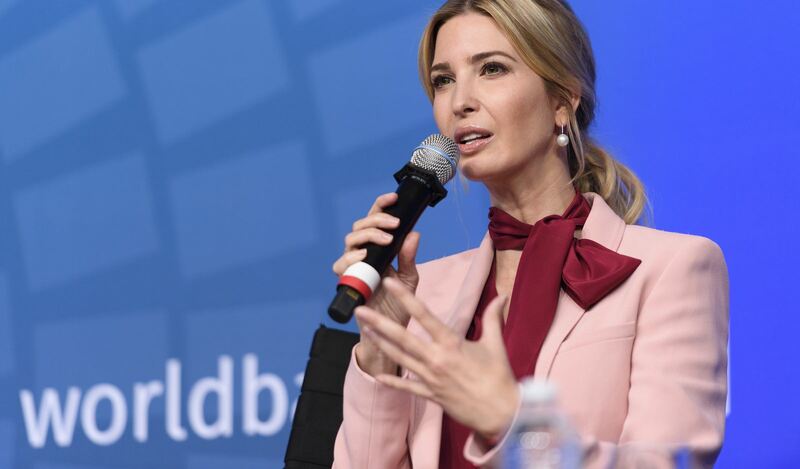 The idea of Ivanka Trump taking over as head of the World Bank was met with some scorn, with comments such as “this is among the most ridiculous proposals I have heard”. But who takes over as President of the World Bank is not within the sole prerogative of Donald Trump. The position is not, as some commentators have suggested, the gift of the White House. Trump can nominate Ivanka Trump, Jared Kushner, or even his favourite rap star Kayne West. Whether they become World Bank President will depend on whether Trump’s nominee is supported by World Bank Executive Directors with at least 50% of the Bank’s voting power. Over the 75 year history of the World Bank, its President has always been an American. But the nationality of the President is not prescribed in the Bank’s articles. It has been an informal “gentlemen’s agreement” since the creation of the Bretton Woods institutions in 1945 that the head of the World Bank would be an American and the leader of the International Monetary Fund (IMF) a European. However, with the changing structure of the global economy, and the increasing importance of emerging markets and developing countries, there has been growing pressure for the governance structures of these institutions to similarly change, both in terms of voting power and also the convention on the nationality of their leaders. Trump’s nominee will need to be supported by World Bank Executive Directors with at least 50% of the Bank’s voting power. The need to reform the governance of the World Bank and IMF has been a major topic on the G20 agenda. In 2009, the communique from the London G20 Summit said: “we agree that the heads and senior leaders of the international financial institutions should be appointed through an open, transparent and merit-based selection process”. While this wording was in response to pressure from other countries, the US (and many Europeans) opposed the inclusion of the phrase at the end of the sentence “regardless of nationality”. To date, neither the US nor Europe has been prepared to abandon the convention on the nationality of the heads of the World Bank and IMF. And they need each other to maintain the convention. The US has just under 16% of the voting power in the World Bank. Taken together, however, the US World Bank Executive Director and those from the European Union have a combined voting power of nearly 50% – enough to appoint the President. The reality is that the US nominee for the position of World Bank President will require the support of EU countries, but this has been forthcoming for in return the US has always supported the European candidate to head the IMF. It is only in recent years, however, that there has been some semblance of a contest for these positions. When Dominique Strauss-Kahn was forced to step down as IMF Managing Director in 2011, the two candidates were Christine Lagarde, the French Finance Minister, and Agustin Carsten, the Mexican Central Bank Governor and former finance minister. Lagarde had the backing of Europe, a number of other countries and the US. Australia, Canada, and Mexico were the only major countries to support Carsten – mainly on the basis that it was damaging for the institution if there was no support for a highly credentialed candidate from an emerging market. When the position at the World Bank became vacant in 2012, the US nominee, Kim, was opposed by two former finance ministers (Ngozi Okonjo-Iweala from Nigeria and José Antonio Ocampo from Colombia). Many considered Kim’s credentials (a health professional and president of Dartmouth) to be weaker for the position than the other two candidates. Nevertheless, Kim was well regarded and the Obama Administration engaged in an aggressive campaign of arm twisting, in the end receiving support from South Korea, most of Europe, Canada, Australia, Russia, and reportedly, China, India, and Mexico. The big step forward was that the process was open and not the outcome of deals in the back rooms of Washington and Europe – as had been the case in the past. The key point, nevertheless, is that a US nominee will only be successful if supported by other countries and the US has had to work hard to ensure its candidate is successful. Consequently, while there is considerable hand-wringing about the potential damage to the World Bank if Trump nominates a candidate that supports Trump’s “America First” approach, his views on climate change, and apparent opposition to multilateralism, such a candidate would only take the mantle if supported by other countries, particularly from Europe. Instead of focusing on the machinations of Trump when it comes to US candidates, the rest of the World Bank membership should follow to the letter the agreed selection process for the position of President. Namely, this is to nominate highly qualified candidates who meet the agreed criteria ( a track record of leadership in a large organisation, international exposure, familiarity with the public sector, ability to articulate a vision for the World Bank, a commitment to multilateral cooperation, and effective and diplomatic communication skills). They can then select the “best” candidate regardless of nationality in an “open, merit-based and transparent process”. According to UN statistics, the rights of youths are uniquely under threat. Veterans respond to the call for the public to thank them for their service. Post-Brexit: Will the Kingdom stay united? Sturgeon has sought a second poll for Scotland, and the idea of Ireland reuniting has been raised again – but none of this is quite as it seems.